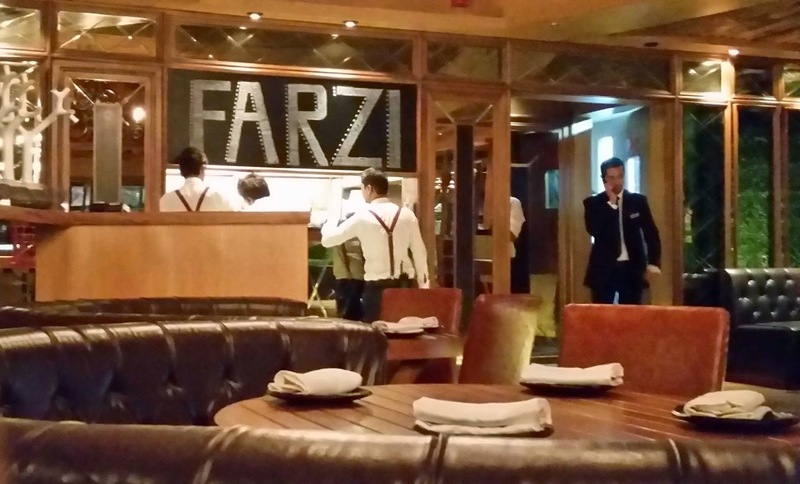 The Farzi interiors are classy and elegant with wooden flooring, teak tables and semi circular sofas. 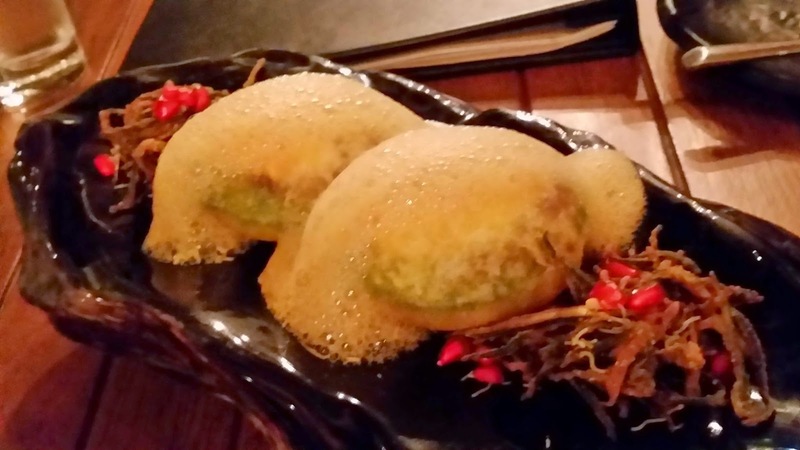 The restaurant is spanned over a huge area with limited number of tables which gives a spacious feel to it. There is also a space reserved for live performances, where artists like Hari and Sukhmani gave a sufi electro performance recently. We started off with the amuse bouche, a mishti doi bubble with strawberry coulis. They are taken as simple shots and the sudden burst of sweetness really takes you by surprise. 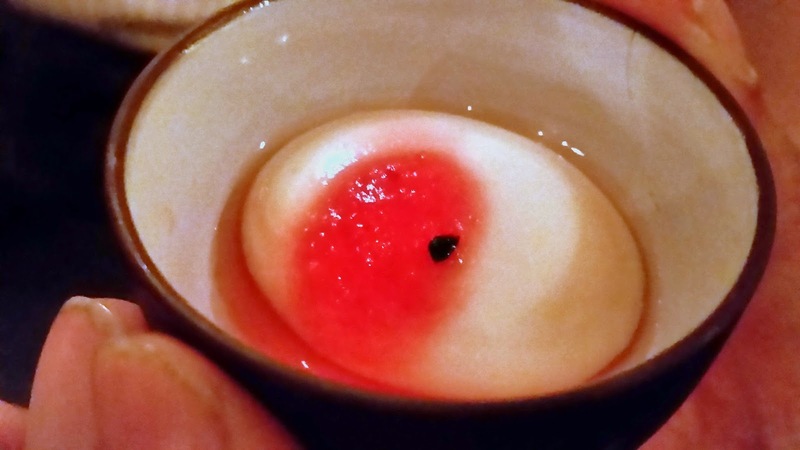 The doi bubbles are prepared using reverse spherification, creating a small membranous coating over the shots keeping the mishti doi from flowing. 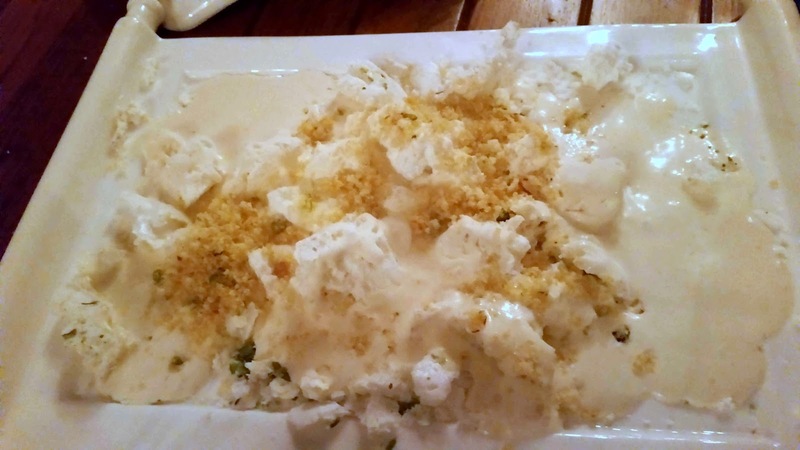 One of the more famous items in the Farzi menu, the Raj Kachori is quite different from the traditional one and is served inverted with a yoghurt foamy chutney filling with spicy, deep-fried okhras to complement it. 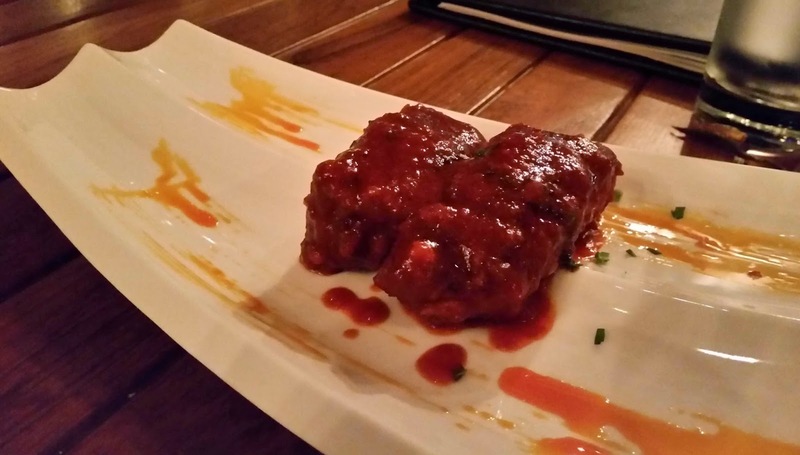 The Chilli Pork Ribs in Rishta Reduction was the next dish we tasted. I was extremely intrigued by the name as it suggested the combination of the Kashmiri Wazwan fiery red curry with chilli pork ribs. Although, the dish wasn't as spicy as I expected it to be, it was very well cooked and the meat was soft and came off the bone very easily. Another dish worth trying is the Cheeni Parantha in Duck Liver Masala. 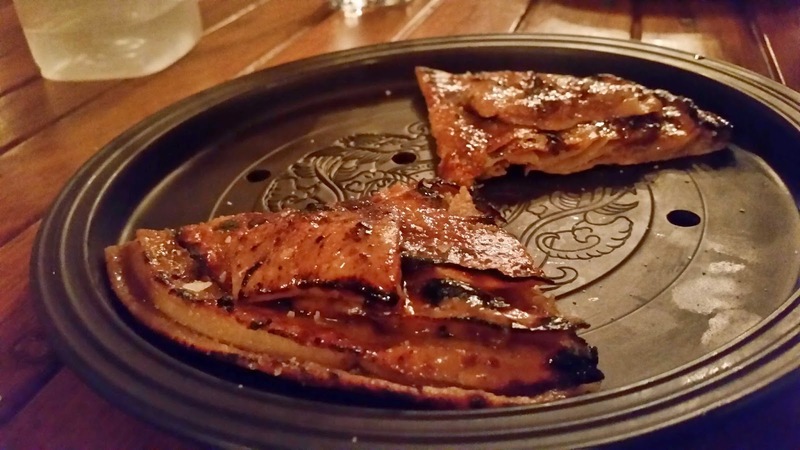 A very out of the box combo, the caramelised sweet parantha is portioned into four different parts with a small part of duck liver glazing the top of each quadrant. Although, I would have liked it even more if the duck liver piece was bigger, the creamy liver along with the sweetness of the parantha runs a riot of different tastes in your mouth, something which might not be enjoyed by all but coveted by a few. 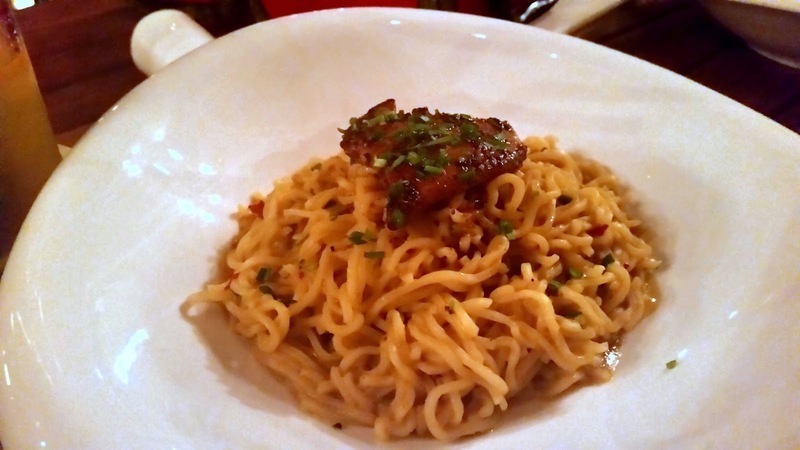 In the mains, we went for the Galauti Kebab Burgers and the Posh Maggi with Foie Gras. 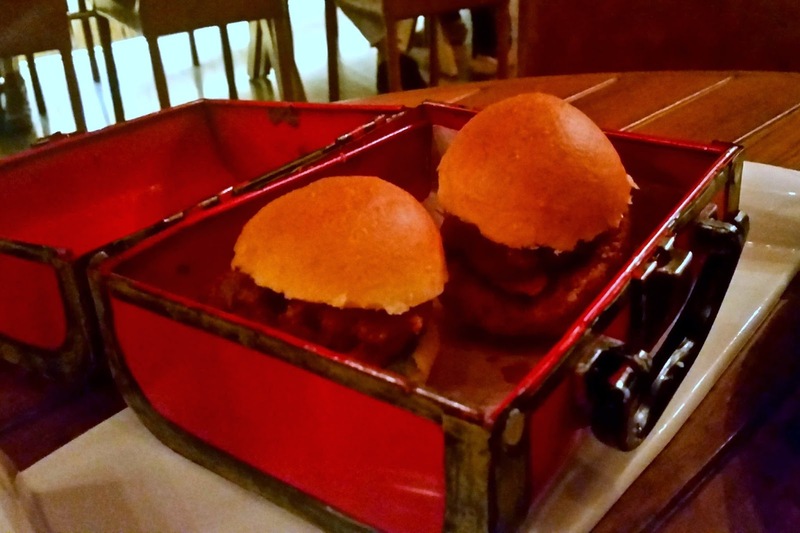 The Galauti Kebab Burgers were delightful and served in a small red briefcase. There is very little that can go wrong as putting a galauti in between two buns is an easy task but the meaty, melt in mouth galautis made me go gaga for it. The Posh Maggi was a slight bit disappointing in comparison as the novelty factor was missing; even the thick consistent Foie Gras failed to enhance the taste of the masala maggi. I would have liked if they experimented with the mains as much as they have done with the starters which are definitely something unique and out of the world. Amongst the desserts, my favourite was definitely the Roohafza Creme Brulee, while the Phirni Oxide came in a close second. Served with Kiwi Falooda, I was bit apprehensive about this dessert as Roohafza is often extremely sweet, one of the main reasons why I don't like it much. 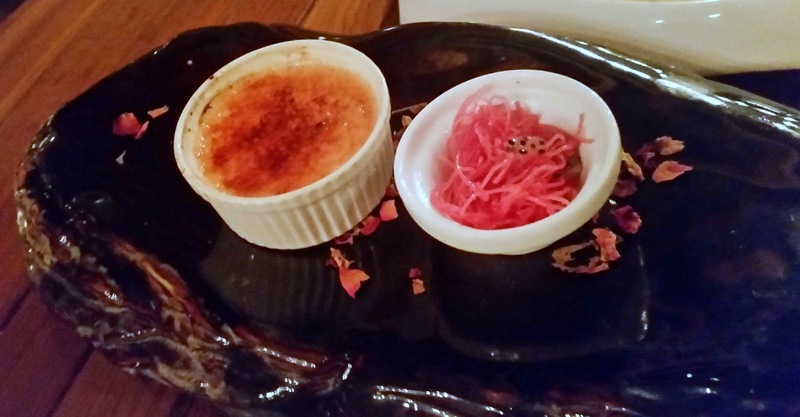 However, the creme brulee concept was wonderfully executed with the sweetness was tempered by the burnt flavour. The Phirni Oxide is almost made right in front of you and deserves top marks for the presentation. The phirni is first frozen with liquid nitrogen and hot rabdi is poured all over it, a class act of molecular gastronomy. The resultant taste is that of the semi solid phirni with rabdi adding its creaminess to the dessert. 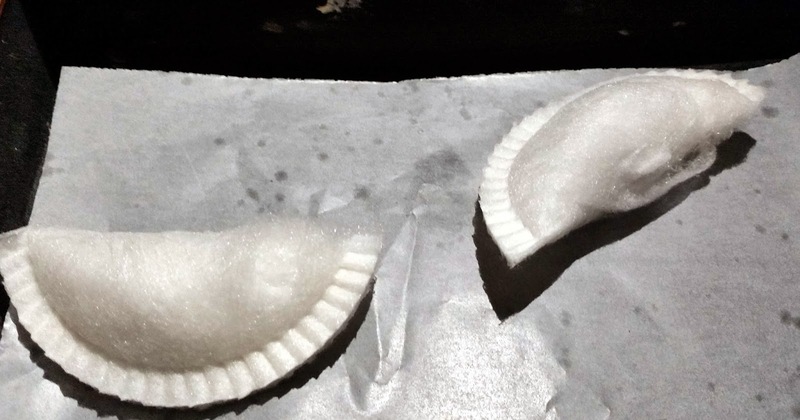 Instead of serving paan at the end of the meal, as is done traditionally, Farzi surprises you one more time in the form of cotton candy paan gujiyas. Though the Farzi Cafe has some strict unbending rules such as no children allowed during dinner time and no reservations after 1pm for lunch, the service is impeccable. The waiters are extremely courteous, helpful and extremely efficient, though a part of the credit for efficiency goes to the constant communication with each other through walkie-talkie earphones. Yes, the concept is indeed fascinating. The combo of science and food can prove to be a deadly one ! !